Have you ever looked at an eagle and thought how majestic they look when gliding through the sky? Most people have and to experience that freedom for yourself you need to experience gliding. There are a range of gliding courses and gliding experiences that are suitable for the adventurous beginner through to the mature glider. Soar like an eagle and have a bird's eye view of the amazing scenery from inside a glider. 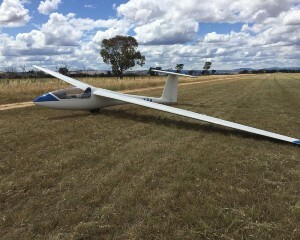 If you enjoy Australia's scenery, than there is no better way to take it in than starting a gliding course or getting into the cockpit for your first gliding experience. Mad About Sports features gliding in Brisbane, Melbourne, Sydney, Perth, Hobart, Canberra and Darwin and across many other great locations. Do an Aerochute Trial Instruction Flight in NSW and spend 20 minutes in aviation heaven! This experience lets you take the controls of an awesome aerochute. Start by being coached on the fundamentals of piloting an aerochute, then take to the skies for this once-in-a-lifetime experience! Do an aerochute trial instruction flight in Werribee! If you have ever wanted to experience the thrill of free flying, the time is now. The aerochute is an innovative flying machine, completely different to anything you've experienced before. Be one of 1000's of Aussies reaching new heights! Come and experience tandem sky diving from the closest centre to Melbourne. Experience the All About You Package. You leave the plane at 10,000 feet giving you the rush of freefall! Then pull the cord of your parachute to glide gently to the ground in preparation for your landing! This is the best way to see Byron Bay and surroundings from the air. first we will fly over Bangalow than we will turn to the coastline and Seven Mile Beach. Then we fly along Broken Head National Reserve, Tallow Beach, Cape Byron, the famous lighthouse and Main Beach for landing at Tyagarah. the celebrities favourite treatment! Non-invasive, relaxing, controlled method of skin resurfacing by softly gliding micro-crystals over the skin to clear pores, smooth and stimulate cell regeneration. excellent solution for a special occasion, fine lines, scars, pigmentation, sun damaged/dull skin. Enjoy a relaxing massage with a special person in the same room at the same time. Experience a 30 minute flight in a glider, high above the picturesque landscape of the Caboolture region! View stunning scenery at heights of 3500ft and experience the beauty of silent flight as you take in the spectacular views! Experience a 45 minute flight in a glider, high above the picturesque landscape of the Caboolture region! View stunning scenery at heights of 4500ft and experience the beauty of silent flight as you take in the spectacular views! Soar like an eagle high above the picturesque Camden valley, with views to the Sydney skyline and the rugged Blue Mountains, enjoying the unique thrill of silent flight that only gliding can provide. Ever wanted to fly like a bird? You can in a glider! Gliding is a fun way to see the world from a different angle. Soaring 3500ft above the picturesque Camden Valley, get spectacular views of Sydney and the distant Blue Mountains. You'll feel and absorb every second of this brilliant experience! Enjoy the unique experience of a silent gliding flight from 4,000 ft. Fly the glider yourself and bask in the wonderful Victorian countryside below you. This is an experience so serene, you'll be wishing that you never have to land the glider. Enjoy the unique experience of silent flight from 4,000 ft. Fly the glider yourself and bask in the wonderful Victorian countryside below you. This is an experience so serene, you'll be wishing that you never have to land. Experience an 85 minute flight in a glider, high above the picturesque landscape of the Caboolture region and magnificent Moreton Island! View unspoilt beaches and the stunning scenery at heights of 3500ft and experience the beauty of silent flight as you take in the spectacular views! Enjoy the unique experience of silent flight from 3,000 ft in a glider. Fly the glider yourself and bask in the wonderful Victorian countryside below you. This is an experience so serene, you'll be wishing that you never have to land. Even better, you get to enjoy this three times! Flying in formation behind your launch aircraft you reach 3000 feet, pull the release, peel off and trim to cruising speed. Experience the wonder of gliding, learning how to control the aircraft, banking left and right. This is flying in its purest form. Enjoy the unique experience of silent flight from 3,000 ft in a glider. Fly the glider yourself and bask in the wonderful Victorian countryside below you. This is an experience so serene, you'll be wishing that you never have to land. Experience a 30 minute tandem hang glide over Cape Byron. You will fly with an accredited instructor who will teach you how a hang glider flies. Soar above the cliffs and beaches with eagles and see dolphins and whales in the surf below. For half an hour you will be a bird! Join us on an adventure weekend of horseriding through the picturesque rainforest and mountains of Kangaroo Valley, canoeing down the Kangaroo River and overnight accommodation for two on a beautiful horseriding property surrounded by the Morton National Park. You and three friends can experience the tranquillity and beauty of the Pumicestone Passage on our guided kayak tours in the Moreton Bay Marine Park on the beautiful Sunshine Coast. You will experience abundant bird and marine life up close, magnificent scenery and golden, secluded beaches! Enjoy life in the fast lane. This is the life! Enjoy the freedom of being pampered by professionals while cruising Sydney Harbour in a luxurious Riviera Cruiser. Let our experienced skipper take you and your guests on a tour of Sydney Harbour and its internationally recognised attractions. Microlight aircraft are often described as 'aerial motorcycles' as they have an excellent all-round viewing platform. Feel the wind in your hair as you learn to fly a microlight aircraft during this Melbourne-based microlight training and scenic flight. The perfect gift for any aircraft enthusiast!